Painted on location in 104 degree heat. The interior of the Mezquita is one of the wonders of the world. Originally a Roman temple, the site later became the site of a mosque and eventually a Christian cathedral. Painting here was truly special. 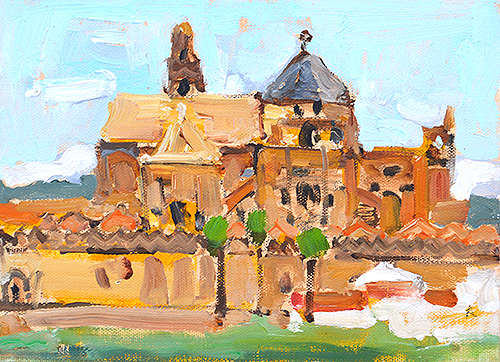 This entry was posted in Landscape Paintings, Urban Landscapes and tagged 5x7 inches, Cordoba, kevin inman, landscape painting, mezquita, mosque, oil on linen on panel, spain, spanish on September 19, 2018 by Kevin. 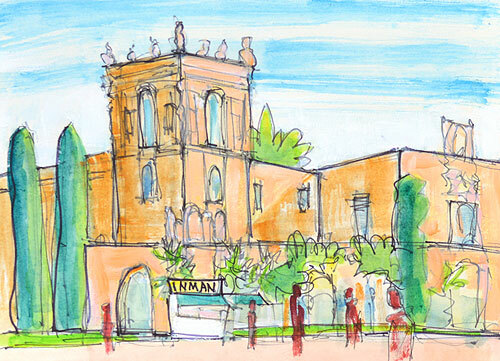 This entry was posted in Landscape Paintings, San Diego Paintings, Urban Landscapes and tagged 5x7 inches, balboa park, plaza de panama, san diego, watercolor on February 4, 2014 by Kevin. A farm in the New River Valley, with autumn just beginning to color the trees. 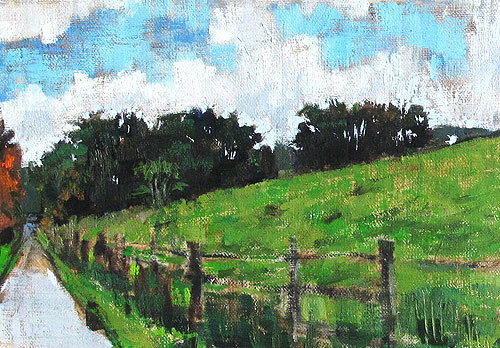 This entry was posted in Landscape Paintings and tagged 5x7 inches, autumn, farm, green, huckleberry trail, landscape, oil on linen on panel, painting, virginia, virginia tech on October 27, 2012 by Kevin. A sun-splashed alley in Hillcrest, with bougainvillea spilling over the fence… and recycling bins ready for their moment in the limelight. 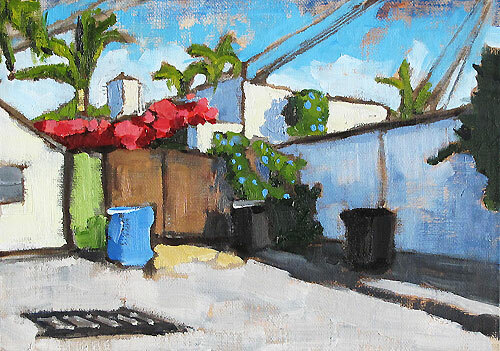 This entry was posted in San Diego Paintings, Urban Landscapes and tagged 5x7 inches, alley, bougainvillea, california, city, fence, flowers, landscape, oil on linen panel, palm trees, recycling bins, san diego, trash cans, urban on October 26, 2012 by Kevin. Cows on the hillside on a gray, rainy day in Virginia. This farm is located in Christiansburg, near Blacksburg and Virginia Tech. 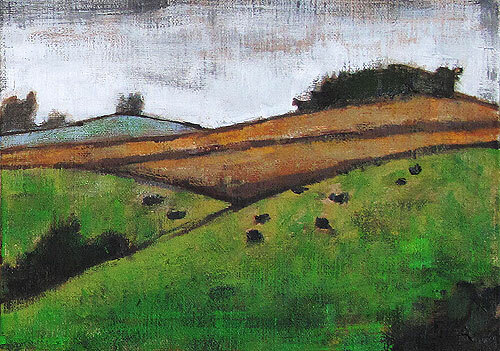 This entry was posted in Landscape Paintings and tagged 5x7 inches, cows, gray, green, hills, landscape, oil on linen on panel, virginia on October 24, 2012 by Kevin. Though you can’t actually see the red rocks in this piece, maybe I shouldn’t have called it that. This is from the Red Rocks national conservation area, though, which is a very beautiful place. This entry was posted in Landscape Paintings and tagged 5x7 inches, desert, landscape, las vegas, mountains, nevada, oil on linen panel, red rocks on October 23, 2012 by Kevin. Sunset in the hills over Santa Barbara, California. This entry was posted in Landscape Paintings and tagged 5x7 inches, mountains, oil on linen on panel, santa barbara, santa ynez valley, sunset, trees on October 20, 2012 by Kevin. A rainy day in Virginia, with the trees beginning to burst with autumn color and the silos veiled in mist over the hill. 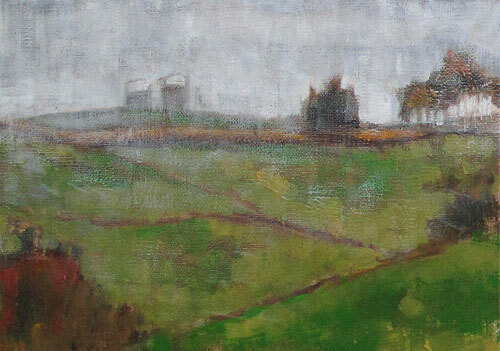 This entry was posted in Landscape Paintings and tagged 5x7 inches, autumn leaves, blacksburg, farm, landscape, new river valley, oil on linen on panel, rain, silo, virginia on October 19, 2012 by Kevin. I think this apartment building in Hillcrest/U Heights is probably from the 60s, since Modern design from that decade was more delicate. Whenever it’s from, it’s a cool place. Decayed Modernism is so prevalent in southern California. Modernist architecture, urban planning, and design had mostly utopian ideals, trying to make people’s lives better through design. Did it work? I’m not sure, and there’s something poignant about the irony of those high ideals contrasted with buildings in disrepair. 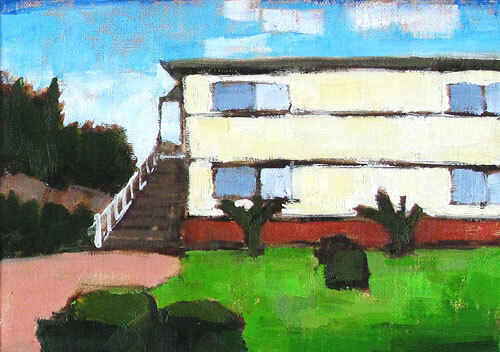 This entry was posted in San Diego Paintings, Urban Landscapes and tagged 5x7 inches, architecture, building, modernism, oil on linen on panel, san diego on October 18, 2012 by Kevin. Morning on the beach in Santa Barbara, cool mist in the air. 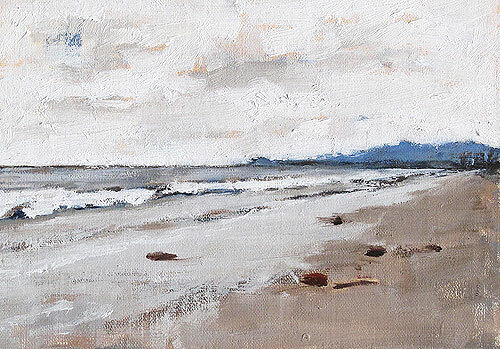 This entry was posted in Seascape Paintings and tagged 5x7 inches, beach, california, gray, grey, landscape, oil on linen on panel, santa barbara, seascape on October 11, 2012 by Kevin. A sunny day on the beach in Ocean Beach, San Diego, California. 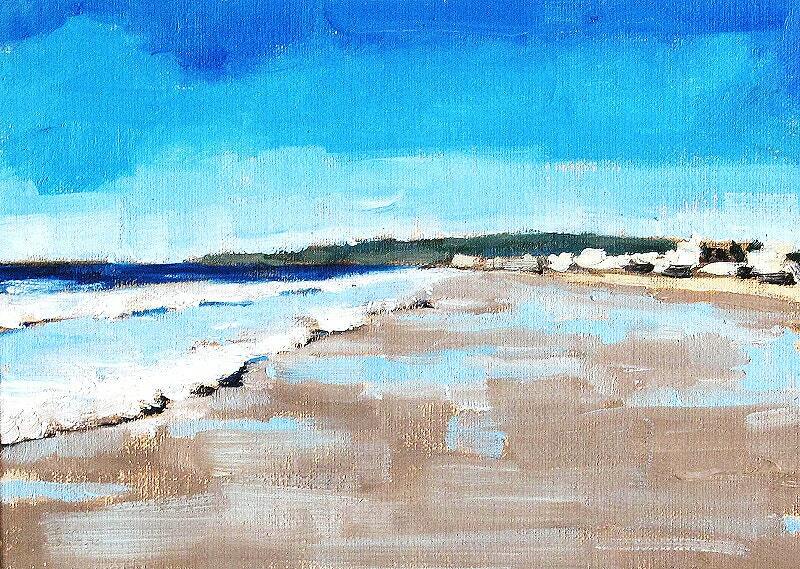 This entry was posted in Seascape Paintings, Urban Landscapes and tagged 5x7 inches, california, ocean beach, oil on linen on panel, pacific ocean, san diego, seascape on October 8, 2012 by Kevin. Steep cliffs above the gently rolling surf in the ecological preserve on Point Loma in San Diego. This beautiful place is full of native San Diego species of plants and animals. 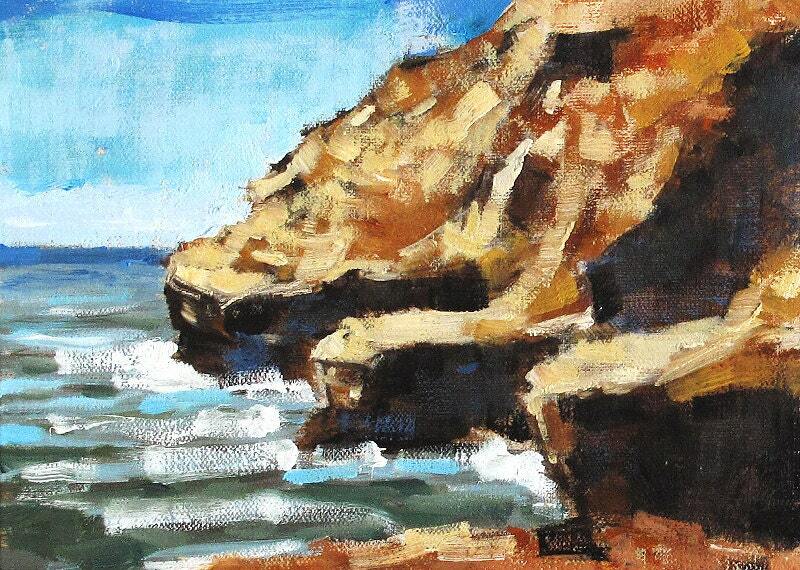 This entry was posted in Seascape Paintings and tagged 5x7 inches, cliffs, landscape, oil on linen on panel, painting, san diego, seascape, water on October 5, 2012 by Kevin. We stopped in an industrial area. I’m not sure where we were- somewhere between LA and Santa Barbara. It was a little town with a palm-lined main street. I liked the quonset hut a lot. I went to preschool in one- a quonset hut I mean. It was on Quantico- a military base in Virginia near Washington DC. 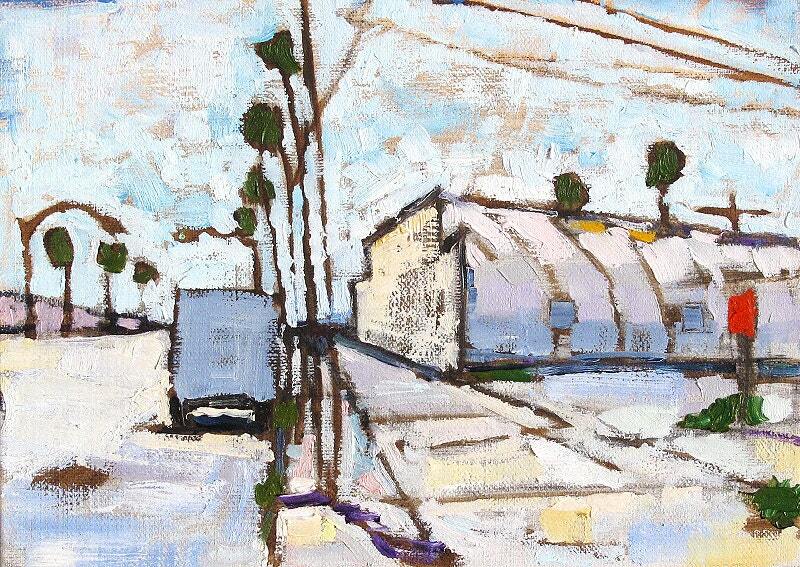 This entry was posted in Urban Landscapes and tagged 5x7 inches, industrial, oil on linen on panel, palm tree, quonset hut, street, truck on September 27, 2012 by Kevin. 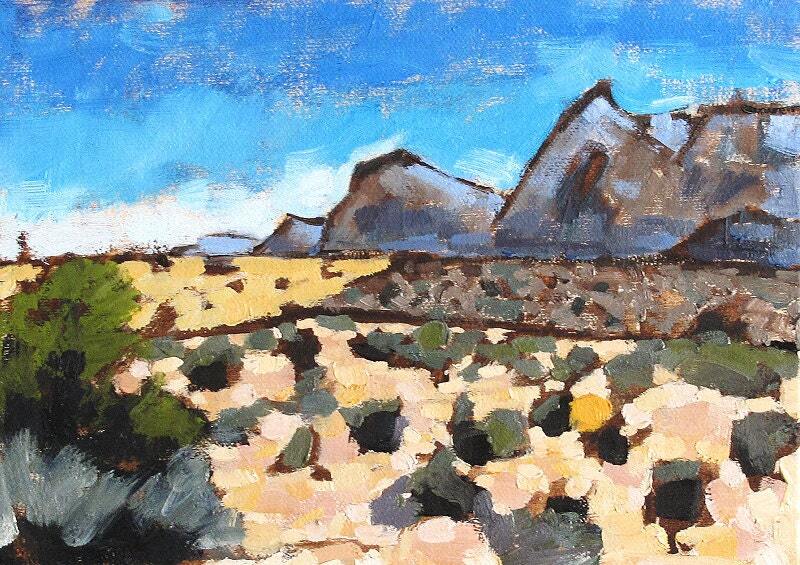 This is the 3rd of 3 plein air paintings from Red Rocks, in the desert outside Las Vegas, Nevada. Those rocks really are red! 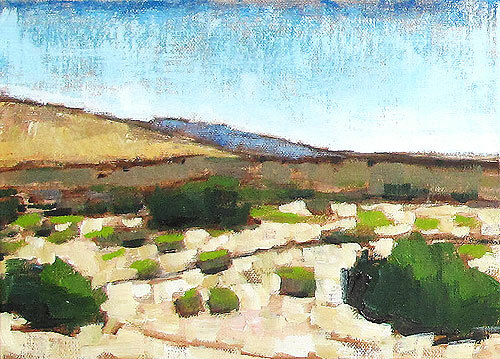 This entry was posted in Landscape Paintings and tagged 5x7 inches, desert, las vegas, nevada, oil on linen on panel, red rocks on September 25, 2012 by Kevin. 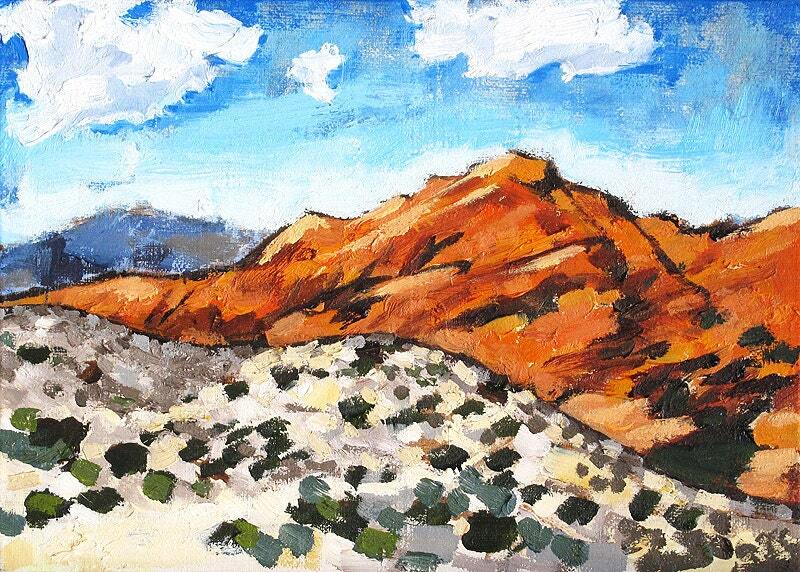 This is the 2nd of 3 plein air paintings I completed in Red Rocks Canyon, near Las Vegas. A really beautiful place. 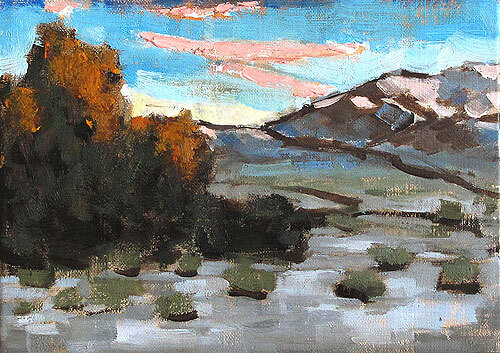 This entry was posted in Landscape Paintings and tagged 5x7 inches, desert, landscape, nevada, oil on linen on panel, red rocks on September 24, 2012 by Kevin.